Just before the holidays our intranet announced that we could ‘buy a reusable cup and receive 10 free hot drinks’. This was part of the Library’s commitment to Corporate Social Responsibility. I was keen to try it out, and have been using my Keep Cup for a couple of weeks now, and am very happy with it. According to their blog, Pret have also recently trialled the Keep Cup. The cups, available in a range of colours, cost £6.00 but customers receive 10 free hot drinks as an incentive. The disposable cups that the Library uses for its takeaway hot drinks have a waterproof waxed coating that means that they cannot be recycled. As part of the Library’s on-going initiative to reduce waste, Peyton & Byrne have identified a product that will reduce the amount of takeaway cups used and provide staff with a better quality takeaway hot drink. 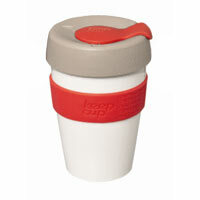 The KeepCup is a high quality reusable cup manufactured from the safest food grade plastic. It is for use with either hot or cold drinks. It has a sealable lid and sipper hole and is pleasing to drink from with the lid either on or off. It is thermally insulated, keeping coffee hot for 30-40 minutes longer than a disposable cup. Each cup also has a thermal silicone band to ensure the cup can be carried comfortably and safely. This entry was posted in British Library, food business, going green, inventions, work/life on 30 December 2010 by ninfield.